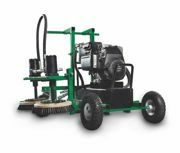 The Scrub Bug™ is a pedigreed pure-blooded scrubbing machine, designed to remove paint from synthetic turf. Its unique counter-rotating scrubbing flat brush design ensures efficient, thorough agitation of paint from both sides of each turf blade, with minimum field wear and tear. The Scrub Bug will quickly earn its way into your heart and a place at the top of your list of smart equipment investments. Easily and quickly relieve compaction on your field with the Air2G2 aerification machine from GT AirInject. Strengthen roots and promote drainage on sidelines, at goalmouths or across the entire field. Probes laterally inject air below the grass, fracturing the soil at depths of 7 inches and 12 inches. Additional benefits include increased microbial activity, improved gas exchange and healthier turf. Air2G2 works fast with little to no disruption of the playing surface. The CarryCat™ tool carrier will fit the three-point hitches of a variety of compact tractors and designed to carry conveniently and securely most commonly used landscaping hand tools. Features include an adjustable holder for 2- to 5-gallon gasoline cans and space for a 7-by-16-inch tool box. A soft-lined mount for chain saws up to 24 inches is standard. A line trimmer bracket adjusts for both straight and curved trimmers. A solid bottom plate keeps trimmers from sliding downward. The newly improved Legacy Multi-functional 3x3 vehicle is a perfect ground conditioning vehicle with AWD on the Sport model. Able to perform multifunctional tasks on turf and athletic fields, the mid and rear hydraulic lifts accommodate a variety of attachments, which are the same on the CVT model. The CVT model has a snowmobile-like drive on the rear axle and a lower price threshold for the economy-minded maintenance professional. The way seedbeds were meant to be made: quick, easy and 100 percent clean the first time. With the Cherrington Rock & Root Picker, there's no need for second passes; the entire surface is screened clean for a perfect seedbed the first time. Remove existing turf for reseeding or sodding. Great for renovations or remodeling turf areas and new seedbed preparation. Screening can be done to any specifications with 1-inch, ľ-inch and ˝-inch screens. Ideal for ballfields, horse arenas and beaches. Jacobsen's new HR700™ is the first and only wide area rotary mower with 14-foot cutting width to increase productivity by up to 25 percent over traditional 11-foot mowers. With its ultra-durable new SureStrength™ decks and superior maneuverability, the HR700 is the ideal mower to cut through even the thickest grass at sports fields, parks and green spaces. The HR700 is part of Jacobsen's new HR Series of wide area rotary mowers. ECHO's new ProXtreme Series™ is redefining the performance standard for grounds maintenance professionals. The full lineup includes a Trimmer (SRM-2620), a high-torque Trimmer (SRM-2620T), a Brushcutter (SRM-2620U) and an Edger (PE-2620). Each features a revolutionary combination of low weight and high horsepower, along with exceptional air filtration, long run time and easy hot re-starts.